Readable, but not up to the mark! Synopsis: The story begins with a murder and moves along at a rather decent rate bringing in new characters almost every 2-3 pages. The author tries to impart a bit of knowledge on the life of the hindu mythological god, Krishna, hence the title. Those readers who have read Dan Brown's - The Da Vinci Code and many other novels along similar plot should take this novel with a pinch of salt.In the end the novel is filled with cliches and plot loop holes that draw away from any positives the book has. Before I begin, let me say that I am a huge fan of thrillers and suspense novels, especially those that have a relook at some historical conspiracies. That is the reason why The Da Vinci Code, despite many of its factual inaccuracies and fallacies remains very close to my heart. When, I received a mail from the BlogAdda book review program that I've been lucky to be selected for reviewing The Krishna Key, i was thrilled! 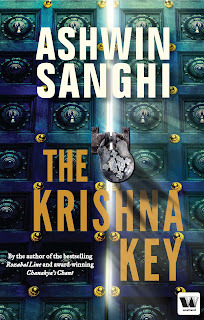 I had gone through the synopsis of the book on the offer page and was immediately struck by the similar plot lines (not exactly similar) between The Krishna Key and The Da Vinci Code. Storyline: The story starts in an interesting note with the murder of Anil Varshney by Taarak Vakil, who since his childhood was made to believe that he is the final avatar of Vishnu- the Kalki by his guru, addressed as Mataji. Due to circumstantial evidence, the suspicion for the murder points to Anil Varshey's close friend and almost brother - Ravi Mohan Saini a historian and Krishna enthusiast. The remainder of the story is an account of the journey of Saini with his doctoral student Priya, the hide and seek between the different characters and a set of carefully designed twists and turns. The story has its moments where it gets dull and cliched with plot loop holes and places where it gently blows away the mind. Interspersed in between are stories of Lord Krishna from his birth to his death and his teachings. The story shifts from Rajasthan to Delhi to Gujarat and Mumbai to the Himalayas, Somnath and finally Agra. We are told about the significance of each of these places with respect to the life and times of Lord Krishna. Positives: A lot of research has been done by the author to present the story in a sensible and accurate way so that the timeline is feasible and looks realistic. The first half of the book is almost a lecture on the life of Krishna but has been creatively portrayed with historic interpretation and interlinking of several distanced unrelated fragments to form a rational whole. Negatives: Plot loopholes abound with the Author/publisher misplacing names , especially towards the end of the novel. In places the book appears as though it is a history lesson and that you're back in a class room. The narrative slacks in the middle third of the book, especially when you're just beginning to find enthusiasm to read the book! The climax of this novel reminded me of 'The Lost Symbol' by Dan Brown. The novel builds the excitement and reaches a climax where it disappoints simply by being anti-climactic. In a way it was very disappointing. Who will enjoy this? - History buffs, People who liked Dan Brown's series - The Da Vinci Code, The Lost symbol. Who may not enjoy this? - People who liked Dan Brown's series - The Da Vinci Code, The Lost symbol!! (Yes :D) and Religious nuts. Buy or Don’t Buy? – It's a tough one to rate this book actually. On one hand the book is well researched and a genuine attempt at a historical thriller, however it does fall short of my expectations. Given a choice, I may buy it but probably not at the original cost. Flipkart at the moment is even giving a Rs.75 discount on the cover price. It’s a steal at Rs.175/-. I have read all books of Ashwin Sanghi and i must say i love the others two but this one is not so fairly constructed. First of all, there are too many things to digest and i like historical facts but the way it produces is disappointing.Although there are some text mistakes as well the plot somehow lacks the gripping enthusiastic. The police run chase and criminal plot was good but not fairly compromised. But beside that the author has done a very good job on imparting such a whopping amazing facts about Hinduism and the Vedic age. Hi Rahul, I haven't read his other books, so cannot comment on them. But this one had a lot of loose ends which I couldn't digest. Hi...need to connect with you for reviews...please drop a message at thereaderscosmos@gmail.com when you receive this message.